We're teaming up with Disney’s Club Penguin (www.clubpenguin.com) - 'the #1 virtual world globally for kids - today in celebration of the Star Wars Takeover launching 25th July. 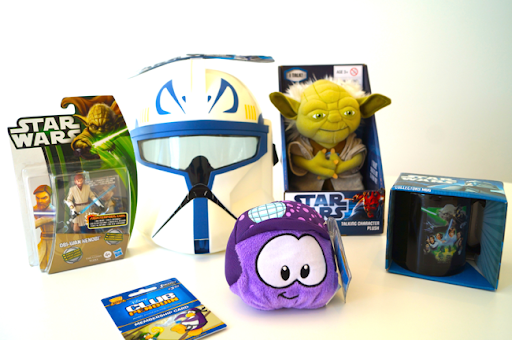 We have one Club Penguin goody bag complete with a one month Club Penguin membership, a puffle plush, Yoda soft toy, Star Wars mug, Star Wars figurine and Star Wars mask. For the Star Wars Takeover, paid members will be able to dress up in costumes inspired by their favourite Star Wars characters and train to become a Jedi Master, thwart Darth Herbert and destroy the Death Star. All you have to do to be in it to win in is leave a 'pick me' comment below before next Thursday. Pick me :-) My boy is just starting to get interested in star wars - much to his Dad's delight! Feel yourself duly picked Louise... by Charlie - congratulations! If you could email me your contact details I'll arrange for the goody bag to get to you. Pick me! Kids have always been obsessed with club penguin and Star Wars! By the way, fab blog!